Thanksgiving Centerpieces! Between perfecting your turkey and pies, don’t forget the rest of the holiday table. 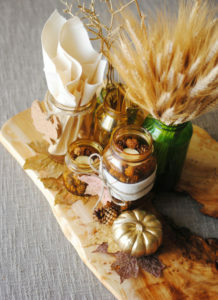 Wow guests with these rustic Thanksgiving table decorating ideas, and get more DIY ideas for table settings and place cards. 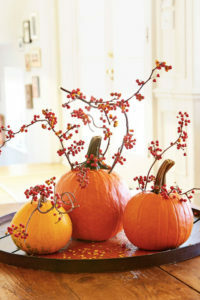 And. . .since this is the day BEFORE Thanksgiving– you can whip up these simple centerpieces in no time. 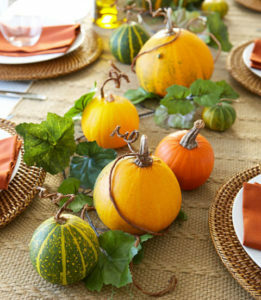 Fill out a row of decorative gourds by weaving in a faux ivy garland. Take this two-step project to the next level by curling wire vines from the craft store around pumpkin stems. Embellished with dried herbs, these candleholders both look and smell amazing. Tie on a bow and the upgrade is complete. Cast glimmering candlelight across the entire table. 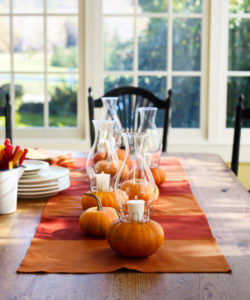 It’s easy when all you have to do is snap off stems and top pumpkins with votives. Shield the flames by securing glass hurricanes with floral U-pins. 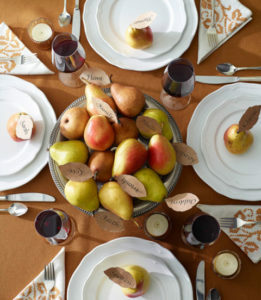 Nestled between pears, paper leaves list what your family is thankful for. After all, that’s what the holiday’s all about (and the food, of course). 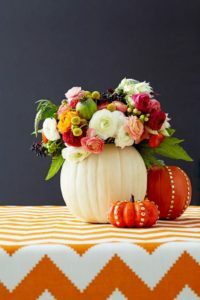 Put your blooms center stage by hiding a water-filled vase inside a hollow pumpkin. Punch it up by adding shiny gold tacks along the ridges. If you don’t want to deal with the mess that comes from scooping out the gourd, drill small holes in the rind instead. Insert sprigs of colorful berries or fresh flower stems, and you’ll get an equally stunning effect. Everyday containers look festive filled with something new. 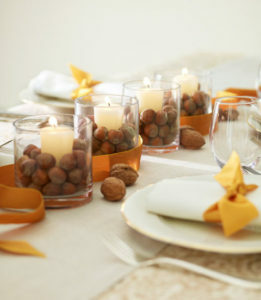 Unshelled walnuts, chestnuts or almonds can all hold short candles in place. Finish it off by winding a ribbon between each vase. 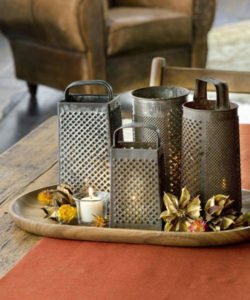 Cast twinkling light across the tabletop with several salvaged graters. The yard sale finds create a glimmering effect when used as shades. 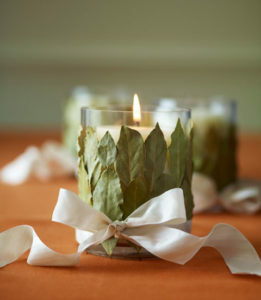 Warm up your holiday table with a scentsational centerpiece — dress pillar candles with dried oranges, lemons, and limes. 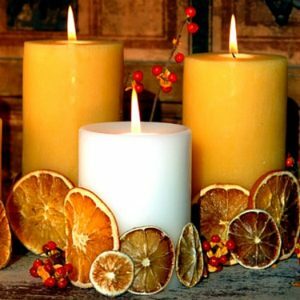 Using a glue gun, connect the citrus slices to each other, forming a band around the base of each candle. Common household items like sauce jars and corkboard get a DIY makeover for this project. Mod Podge mixed with food coloring gives the used jars a sophisticated look while leaves and pinecones add the essence of fall. COURTESY OF I DON’T KNOW HOW SHE DOES IT!